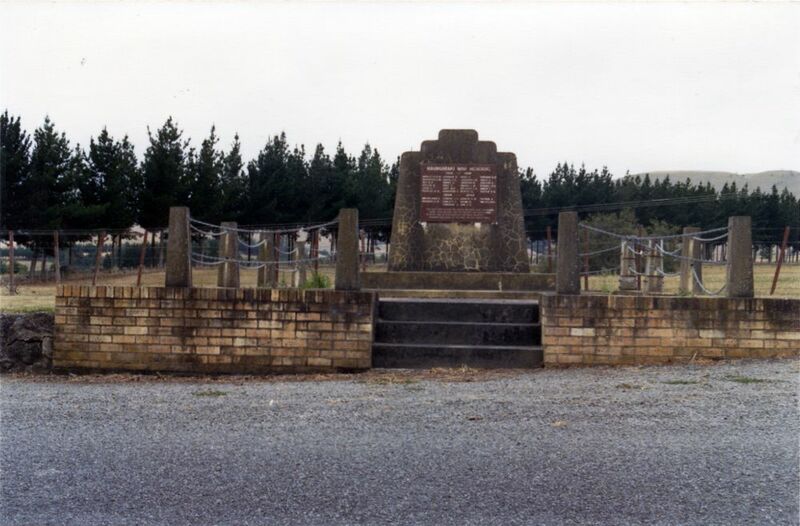 Maungaraki War Memorial, looking east. The memorial, for World War One and Two dead of the Gladstone-Te Wharau-Longbush areas, sits on a rise south of the Tauweru River bridge. The 24 World War One names, and 10 from World War Two are recorded on the memorial stone. An avenue of 36 scarlet oak trees, lining the Masterton approach to the bridge, forms part of the memorial. Unusually, this memorial was not built until after the 1939-1945 war and was unveiled on Anzac Day, 1953 by Duncan McGregor, a long-time settler of the area. He was supported by Bert Cooksley, Wairarapa MP and several hundred locals.